As many of you know, we got clouded out on the date chosen for the Diamond Bar G Ranch Star Party. Several AOAS members and their guests managed to get together and have a great time, anyway. We had a great meal and a lot of good fellowship. It was discovered that many had not seen the PBS presentation of 400 Years of the Telescope that ran at 2:00 AM on a Sunday morning, so we watched at after the meal, and also had an impromptu Magic Show put on by our own Dr. Chuck Larson, who by the way, won the 2009 Magician of the Year from the IBM Magician’s association (I’m not sure of the name.) At any rate, this is a national association, so this is quite an honor. Way to go, Chuck! For those of you who missed the festivities, or those who could not make it due to other obligations, we have scheduled a second attempt at the Diamond Bar G Ranch Spring Star Party for May 23rd, 2009. Be sure to mark it on your calendars! Again, we will have a potluck dinner, so bring a covered dish and your favorite beverage. We’ll start eating at 6:00 PM and then retire to the observing field for some dark-sky viewing and camaraderie. Some of you may have seen the wonderful article in the Living section of the Times Record’s Saturday, April 25, 2009 edition. If you haven’t seen it, be sure to drop by the times record offices on Wheeler and get a copy of that edition, or check it out at the Fort Smith Public Library. Mike Baker, Leonard Lynch, Dr. Chuck Larson, and Bob Moody participated in the interviews and the articles make a great case for AOAS’ relocation efforts. In fact, we’ve already been contacted by interested parties wanting to help out in some way. The Observatory Relocation committee is now working these leads to see what we can do. Summer observing is getting into full swing now, and we have star parties scheduled at the Janet Huckabee Nature Center for Jun 12, August 14, Sep 11, and Nov 13. In addition, the Mulberry Mountain Star Party is happening next month (June) on the 19th and 20th. Camping spots are filling up fast so get your reservations in now! We’ve had a great turnout at meetings and events this past four months. If you haven’t made it to a meeting recently, I encourage you to come to one. We usually have several topics of interest to all amateur astronomers, so you should get something out of it. Normally, we have at least one constellation to cover, equipment tips and tricks, and a highlighted feature on a selected Astronomical League Observing Club. We are looking at Astro-Imaging (AI) and Amateur Telescope Making (ATM) projects in the future as well. With all of this, there should be something for everyone’s taste. So come on! See you at the meeting! Lora and I spent a couple of interesting weeks this winter as a result of the ice storm that came through on January 27th. As many of you know, the electric utilities in NW Arkansas were hit pretty hard, and it took some time for the various utility companies to get power restored to those of us in rural areas. Most people in town had their power back on within a few days, though even a few days is uncomfortable and even dangerous when the temperature outside is in the teens and twenties. It took over two weeks for the power in our neck of the woods to be restored — many folks around us had no way to heat their homes or keep their wells from freezing. Lora and I were lucky. We had a good woodstove and a supply of firewood for heat, propane for cooking and hot water, and since we're connected to rural water, we had that available as well all through that period. But we did come to appreciate the luxuries of electricity. We're so used to just flicking a light switch that I still couldn't break the habit even after two weeks of being without power. I’d walk in a room and automatically flip the switch. As a society, we depend these days on instant communication — getting weather reports and other communication by e-mail and the World Wide Web that we take it for granted that it will be there whenever needed. During this two week period, it was much more difficult for us just to find out what the expected low would be for the coming night, as well as when we might be able to expect the power to return and whether the roads were passable or not. We did find that we could get by with far less than we've become accustomed when it became necessary. Coleman Observatory would be a great place to begin a program dedicated to the study of binary stars, more popularly referred as "double stars". In order to perform proper measurements of binary star systems, a professional-quality bifilar micrometer would be required, just exactly the kind that is manufactured by Van Slyke Engineering (VSE). The cost will be between $2000 and $2500 for the micrometer we'd like to have, and I believe this should be our newest project to raise the funds needed for our own bifilar micrometer during 2006. 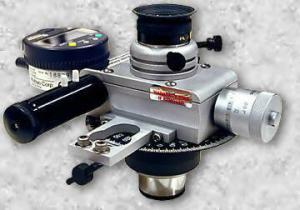 The VSE "NeedleEye" digital bifilar micrometer. Paul Van Slyke Engineering produces a limited number of high-quality, precision bifilar micrometers for sale to amateur astronomers and private observatories. The digital model shown here retails for $2450, but during the current sale, the price has been reduced to $1950. AOAS hopes to raise the funds needed to buy one of these professional-level instruments in 2006, to begin our own binary star program. Binary, or double stars, are two or more stars which appear close to one another in our telescopes. Double stars can simply be two stars aligned such that they only "appear" to be a true pair, but in reality the two stars may be quite far apart with one star being much closer to us than the other. Such chance line-of-sight alignments of stars is not what a program of binary star study is about. True binary stars are pairs of stars that share a common center of gravity, and are bound together by gravity throughout time, forever locked in a spiral dance whereby they actually orbit each other. The only accurate way to measure the masses of stars is by carefully measuring the changing positions of the two stars over long periods of time. Binary systems may complete each orbit in as few as 5 to 10 years, or they may take as long as 20 to 50 years to do so. Such measurements are made by using an instrument known as a bifilar micrometer. A bifilar micrometer is an instrument which has an illuminated reticle etched into a glass as a "crosshair", with a second single-line reticle that can be moved, with exquisite precision, and be placed over the secondary star of a pair allowing for their separation to be recorded with extreme accuracy. The crosshair reticle can be rotated so that one of the illuminated lines might be oriented to celestial north. This thereby allows the angle of a binary pair to be determined as measured in a clockwise direction away from 0 degrees, which begins at true north. Such instruments are not a common item for sale to amateur astronomers, and those with the quality of workmanship desireable for high-quality measurements are not cheap. A very limited number of companies offer such instruments, and among the best in the world today, are those available from Van Slyke Engineering. Click on "read more" for the rest of this story. 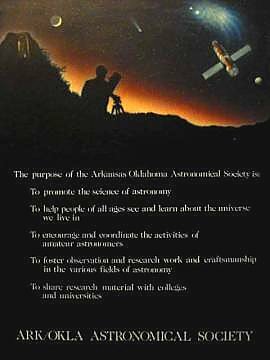 The Arkansas Oklahoma Astronomical Society was formed in early 1985 in Ft Smith, Arkansas. We established our own constitution and preamble based on that of the Astronomical League, spelling out our goals and desires as amateur astronomers. These goals are directly related to what we want to do with where we see ourselves going in the immediate future. As you can see from our preamble, education has been, and always shall be our most important goal. This installment for our “Chart Room” section will define what we’d like to do to help the schools and their students of our area. We want to help every student understand what astronomy is, but more importantly, we want to illustrate why a complete understanding of science and mathematics is essential to a good education. That in turn is crucial for our country to maintain its technological edge in the 21st Century. Our American children score as well as or better than children from other parts of the world for achievement test scores up to the fourth grade. Thereafter, test scores for US students begin to falter through the eighth grade level, and continue falling behind their foreign contemporaries all the way through to high school graduation. Our college freshmen are not as well prepared for learning at this level as college freshmen in other countries around the world. AOAS feels that astronomy has the potential to raise the test scores of American students to higher levels of understanding by encouraging them to see the interdisciplinary connections between astronomy, physics, chemistry, biology, geology and mathematics. We feel that that understanding needs to happen early in a child’s education and have some way of continuing to stimulate and enrich our students as they reach the college level. Indeed, there are many benchmark requirements set forth in US Education Reforms which stipulate that a child’s education be supplemented with astronomical concepts as early as the first grade. We would suggest that even more astronomical concepts be included in the curriculum of our youngest students. Space science and all things astronomical are such exciting and inspirational subjects for young children that they are among the only subjects that can capture and hold a child’s interest longer and more thoroughly than any other single subject. With proper reinforcement of their understanding early on, we would then recommend a much more aggressive campaign to further enrich their understanding with more astronomical knowledge and interdisciplinary concepts for the remainder of their elementary and secondary education. It doesn’t seem that long ago when I was a child growing up in Sallisaw, Oklahoma. As a youngster of only two-and-a-half, I distinctly remember being taken outside with my mom and dad, my uncle, aunt, cousin and grandmother all standing around the yard with even a few neighbors waiting for something. It was a starry night and suddenly my uncle cried out, “There it is!” and pointed to the sky. Approaching from the southwest was a moving star, a satellite known as Explorer 1, the first U.S. made object to orbit our little world. That’s one of my earliest memories, and yet the recollection seems as clear as if it were a recent thing. It would be another year or two before we’d have our own television set and years more before I’d begin to understand how fast things were changing. Saturdays spent watching Commander Cody fly around with his rocket backpack were my favorite pastime. In the first grade my fellow students and I were crowded into a classroom with the only TV in Liberty Elementary School to watch Alan Shephard ride a tongue of flame skyward as the first American astronaut. My grandparents had been born in the late 1800’s. They had seen fantastic changes in their world in the first half of the 20th Century going from riding to town in a horse-drawn wagon to automobiles. My parents had gone from seeing travel by trains and cars to travel by planes and spacecraft. I’ve seen the birth of the Space Age and the most fantastic findings of the 1980’s and 90’s with the exploration of our solar system and the discovery of the first extra-solar planets orbiting around neighboring stars. Watching Explorer 1 from this context now “feels” like something out of the Stone Age. A long time ago, in a place far, far away...... wait a minute, that has been done already. It does, however, make for a good segue into what I want to say in this new and very different section of your AOAS web site. Here, I will summarize through numerous upcoming articles what we have long wanted to do as one of the most active astronomy clubs (for our size) in the entire country. Efforts are underway to provide AOAS with our own portable planetarium and science equipment which will benefit not only our club meetings and astronomy classes, but also area school systems. In addition to this, we also want to develop an advanced, remotely accessible, research-grade telescope and imaging system to be used for professional type observing programs by our members and will once again also be made available to area schools as well as the University of Arkansas Fort Smith.